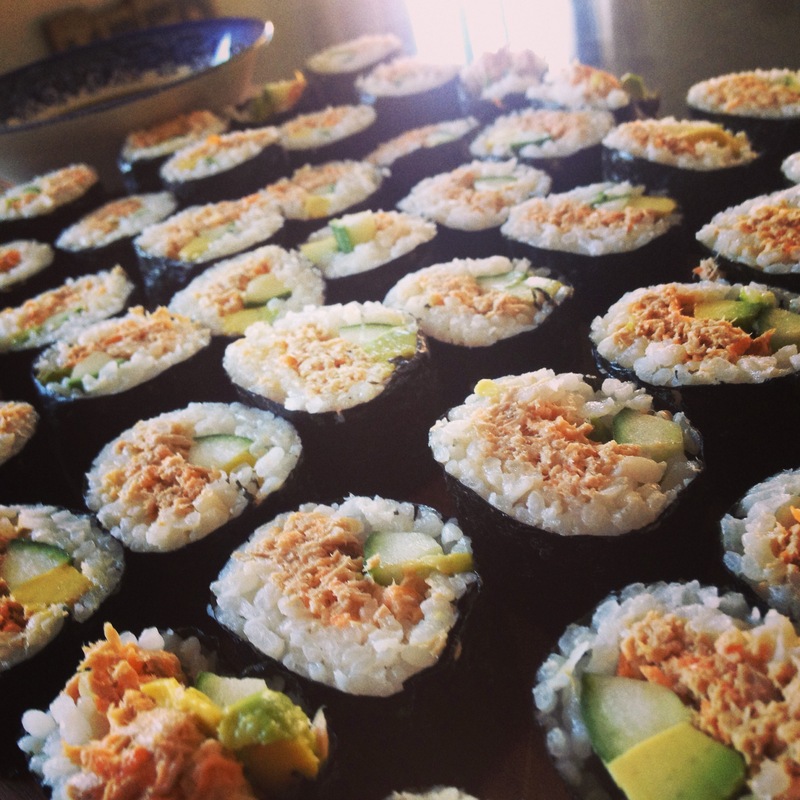 Tuna Nori Maki Sushi – Tuna Seaweed Rolled Sushi. Add rice and water to rice cooker and switch to cook. If you don’t own a rice cooker you should seriously consider buying one. You can get the very cheaply and they are amazing and always produce light, fluffy, well cooked rice. Add rice wine vinegar, sugar and salt to a small pan on low heat and stir until the sugar and salt have dissolved. Many people add the ingredients directly to the rice without allowing them to dissolve, however this will result in a gritty rice and uneven flavour distribution. Add the mixture to the rice, stir and allow to come to room temperature. Drain the tuna to remove as much excess liquid as possible, add to a medium sized bowl with mayonnaise, carrot and shallots and mix until well combined. Carefully remove the nori sheet from the packet and place shiny side down on a dried surface. Cover 3/4 of the sheet in a thin layer of the rice mixture, try for no more than 3-4 grains high. The rice should extent from side to side on the nori and finish 3/4 from the top. Form a line of the tuna mix down the centre of the nori extending from side to side. Place a slice of the cucumber and avocado alongside the tuna mix. Dip your fingers in the small bowl of water and run along the exposed end of the nori sheet. Take hold of the front of the nori sheet and lift slightly, using a very quick motion roll the nori into a circle, speed is key here if you hesitate it WILL all fall apart. Allow to rest until the nori has softened. Slice the nori maki into 1-2cm pieces. Serve with chopped chilli in soy sauce and wasabi. You can also serve it with kewpie if you wish.